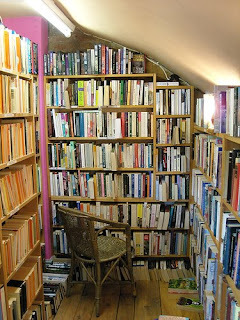 This bookstore is located in Much Wenlock (or just simply Wenlock), a pretty little town, and blessedly and blissfully free from heavy traffic, located in central Shropshire, England. The bookstore won the Independent Bookseller of the Year Award in the year of 2006 by Booksellers Association of UK and Ireland and in 2008 The Independent listed Wenlock Books as one of the top 50 bookstores in the country. Wenlock Books is an independent community bookstore founded in 1987 by Perce Muscutt who completely renovated an old dilapidated building and made it into a lovely bookstore. A couple of years ago, Anna Dreda, a 14 year long employee of the bookstore took over the business in order to persue her lifelong dream of running a bookstore. Adding a personal touch and a few changes, indeed has that dream developed into something wonderful - a bookstore which many people refer to as the bookshop with heart. Downstairs there are new books and a lively colored children's section with mini shelves and mini chairs for the kids. The first floor is literally covered in books from the bottom to the top. The whole mixture of the new and old of the bookstore gives it a special feel - add the personal friendly service and a carefully selected stock of books and you have a perfect recipe for a wonderful bookstore. 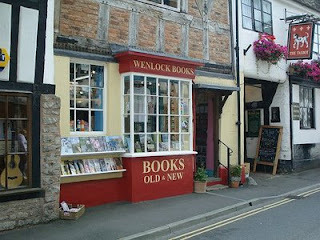 Wenlock Books, spreading on two floors is situated in a beautiful 15th century building in the center of Much Wenlock in Shropshire. The bookstore offers both new and second-hand books of various subjects, especilly contemporary fiction and children's books, but books on politics, history, nature and local interest books as well. The owner, Ms. Dreda also sells Fairtrade organic coffee and tea, together with sugarfree organic lollipops for the children visiting the bookstore. She is also an initiator of three regular reading groups which meet up in Wenlock Books. Visited early April and found a good 2nd hand stock of books, pleasant atmosphere and a warm welcome. There is now a 2nd shop (just down the road)called Much More Books Ltd with mostly 2nd hand stock and a great range of WW1/2, art, travel etc books. Well worth a visit.